Thimphu Domchoe is an annual festival celebrated by the Bhutanese every year. Officially known as The Thimphu Lhamoi Domchoe, the main attraction during this festivity is the Trashi Chhoe Dzong where monks performs the masked dance and is witnessed by thousands of people which also includes tourists who come in large numbers to Bhutan only to experience the unique way of celebrating festivals. The local men dress in their traditional outfit known a gho and women dress in their traditional outfit known as kira. The masked dances are performed by the monks at the main courtyard known as dochey which ould be packed by lots of people. 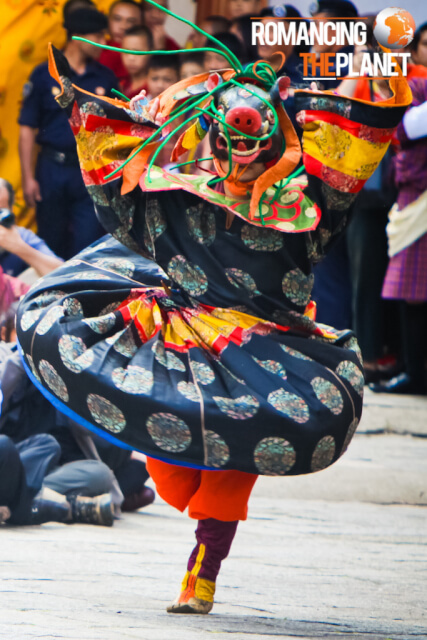 These dances tells various mythological stories from the Bhutanese history. Masks of pigs, donkeys and various other animals are worn by the monks and performance is done. This event would be followed by three day festivities known as Thimphu Tsechu, where not only the monks dance, but also the local citizens get the chance to show their dance. View more pictures of Thimphu Domchoe on my Flickr channel.